Chris Lee opened the door for Univeristy of Hawaii Academy for Creative Media students by taking 4 interns to work on the blockbuster movie Superman Returns. Chris is the current President of Chris Lee Productions and former President of Production for Tristar Pictures and Columbia Pictures. Learn how Chris worked his way to President from a script reading position and led the studio to produce Academy Award-Winning films like Jerry Maguire, Philadelphia and As Good As It Gets. Chris also shares his global vision for the UH Academy for Creative Media and how it benefits Hawaii and the U.S. He talks about the struggles to get the program off the ground along with the entrepreneurial strategies they employ to become successful. Now that the program is running successfully Chris turned down the Presidency of Legendary Pictures to allow more time for the Academy. What is your average day like running a movie studio? Let’s talk about your story, how did this all begin? Is it more important who you know or what you know? Was it hard to continue producing movies from Hawaii? What was the first big movie you were involved in? What did you do? You started your career at ABC’s GOOD MORNING AMERICA, then worked with acclaimed director Wayne Wang as the Assistant Director and Assistant Editor for the film DIM SUM. Later you joined TriStar Pictures in Los Angeles as a script analyst moving up the executive ranks to president. How was the road to presidency? Can you tell us the story behind the Academy for Creative Media at the University of Hawaii which is their film, video game and visual arts school? What makes the school Different? What is the vision and mission for the UH ACM? How do you envision the UH ACM benefiting the community and Hawaii? You took students to work on the Superman Returns film in Australia. What growth did you seen in that experience for them? Do you think Hawaii has enough talent to have successful Hollywood careers? Any success stories yet from the UH ACM program? Any advice for today’s young business person? What has been the most difficult challenge in your career and how did you overcome it? Was there a breakthrough or tipping point in your career? Do you continuously get inspired to draw based on life experiences and situations in real life? Is it tough to stay abreast of the changing technology in your field? Does technology just help your images come to life a lot easier? What’s the most important things needed to becoming successful in Hollywood? What is the ideal path and preparation to a Hollywood career? How did you develop your business skills and entrepreneurial abilities? What’s the most important things in running a movie studio? What are the most common mistakes you see people make when pursuing a Hollywood career and how can they avoid them? What are the biggest mistakes you see business people make and how can they avoid them? Do you have a mentor and how have they helped you? What are you working on now? Anything we should look forward to seeing? CHRIS LEE is the former President of Production for TriStar Pictures and Columbia Pictures, President of Chris Lee Productions, and the founding Chairman of the University of Hawaii’s new Academy for Creative Media (ACM). During his tenure as an executive in Hollywood, Mr. Lee supervised such Academy Award-winning films as JERRY MAGUIRE, PHILADELPHIA, and AS GOOD AS IT GETS. He also worked on numerous other hits such as, MY BEST FRIEND’S WEDDING, LEGENDS OF THE FALL, THE FISHER KING, THE MASK OF ZORRO, STARSHIP TROOPERS, GODZILLA, STEPMOM, GO and THE PATRIOT. His current project includes the blockbuster SUPERMAN RETURNS. As head of Chris Lee Productions, Mr. Lee produced Columbia Pictures’ smash hit SWAT, starring Colin Ferrell and Sam Jackson. Chris Lee Productions also produced Warner Brothers’ action picture BALLISTIC: ECKS VS. SEVER starring Antonio Banderas and Lucy Liu. Previously, Mr. Lee produced the world’s first photo-realistic computer animated feature, FINAL FANTASY, for Square Pictures and Columbia Pictures. Chris Lee is also the executive producer of the animated series HEAVY GEAR, has had feature projects and television series in development at various studios, and produced music videos for artists ranging from Janet Jackson, The Backstreet Boys, Faith Hill, Elton John and Destiny’s Child. 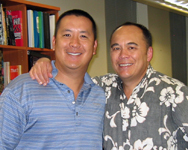 Raised in Hawaii, Mr. Lee returned home in 2002 to create the Academy for Creative Media, a system-wide initiative involving all ten campuses of the University of Hawaii. Designed as an economic engine for the state, the ACM recognizes the transformation of entertainment media through technology, emphasizes the coming dominance of global popular culture, provides a platform for indigenous voices to tell their stories to the broadest possible audience, and focuses on attracting digital technology, software creation and interactive programming companies to the State of Hawaii. Mr. Lee began his career in entertainment after graduating from Yale University with a degree in Political Science. His first job was with ABC’s GOOD MORNING AMERICA. He then worked with acclaimed director Wayne Wang as the Assistant Director and Assistant Editor for the film DIM SUM. Mr. Lee joined TriStar Pictures in Los Angeles as a script analyst moving up the executive ranks to the post of President of Motion Picture Production and subsequently holding the same position at Columbia Pictures. Mr. Lee is very proud to have been the first minority and Asian American to be President of Production of a Hollywood studio. He currently serves on the State of Hawaii’s Film and Television Development Board and is a founding member of the Coalition of Asian Pacifics in Entertainment (CAPE). Mr. Lee was consistently named one of A Magazine’s most influential Asian Americans, served on the board of the National Asian Pacific American Legal Consortium in Washington DC and was member of the Committee of 100. He is proud to have received numerous honors including the Justice in Action Award from the New York Asian American Legal Defense and Education Fund, the Visionary Award from East-West Players in Los Angeles, and the Museum of Chinese in America’s Role Model Award. Legendary Pictures is a newly formed independent production company founded by a highly-regarded team of entertainment and media executives that has established a unique strategic partnership with Warner Bros. to create, develop, co-produce, co-finance and distribute major motion pictures. The Company’s objective is to become a leading player in the film industry by creating a portfolio of profitable films, which over time will build into a valuable library. Warner Bros. Pictures and Legendary Pictures announced an agreement in principle for a multi-year, 25-picture deal, subject to certain provisions to be jointly produced with and distributed by Warner Bros. Pictures. The slate under this agreement will include a variety of films, among them major event releases and pictures of varied genres. In addition to partnering on Warner Bros. Pictures-developed projects, Legendary Pictures will actively develop its own projects as a part of the 25-picture slate.